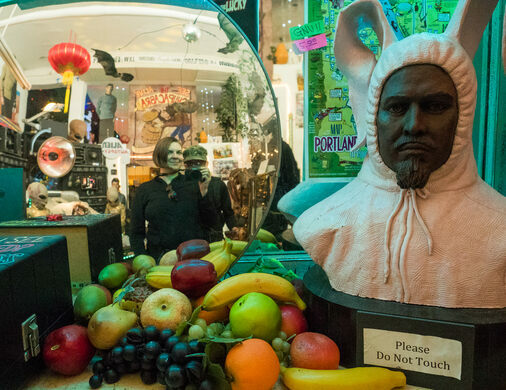 The sentiment of the oft-repeated slogan, “Keep Portland Weird” is exemplified in the eclectic shop/museum known as the Freakybuttrue Peculiarium. 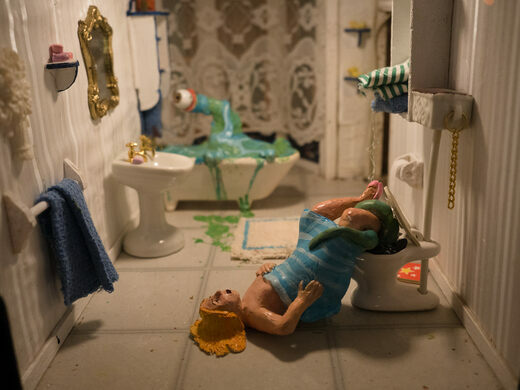 According to the Peculiarium’s website, the shop and art space was established in 1967 by a Portland, Oregon explorer named Conrad Talmadge Elwood whose love for all things weird, freaky and zany caused him to have a dream of the store which he promptly forgot. While Elwood’s story is suspect, the fabricated origin is perfectly in character for the shop which seems to celebrate pranks and hucksterism. 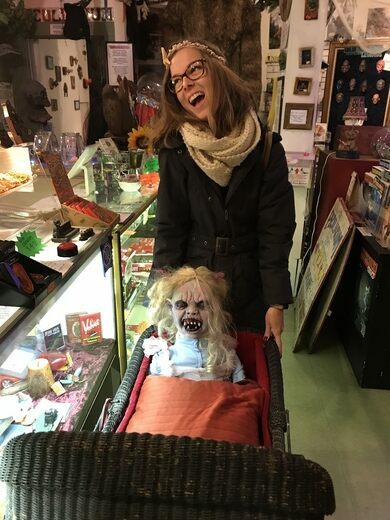 The gift shop space contains a massive Bigfoot statue that greets customers and the shelves are jam-packed with weird pop artifacts, cheap gag toys, and creepy specimens. 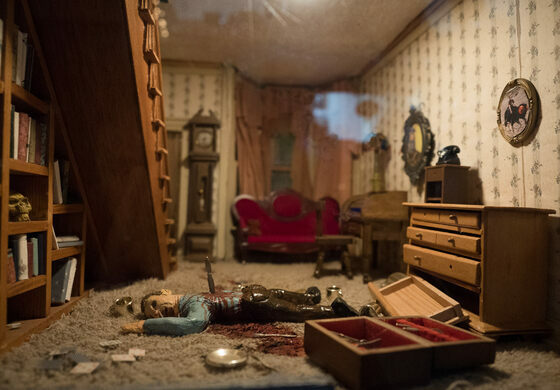 In the Peculiarium itself, the wide variety of exhibits include a nightmare dollhouse, a lot of very odd drawings and memorabilia, and even a trip inside a zombie’s brain. Photography is encouraged and there are great places for visitors to take selfies, including a seated, evil-looking Krampus with blazing red eyes and a life-size recreation of an alien autopsy. In addition to the items for sale, the space doubles as an art gallery, spotlighting talented local Portland artists who can hang their works among the bustling kitsch ephemera. 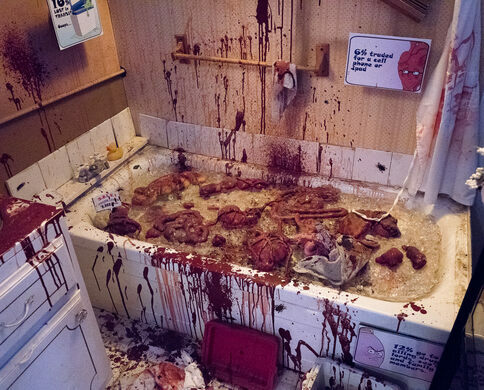 Ironically the Freakybuttrue Peculiarium’s most squirm-inducing attraction is not its fake severed body parts. 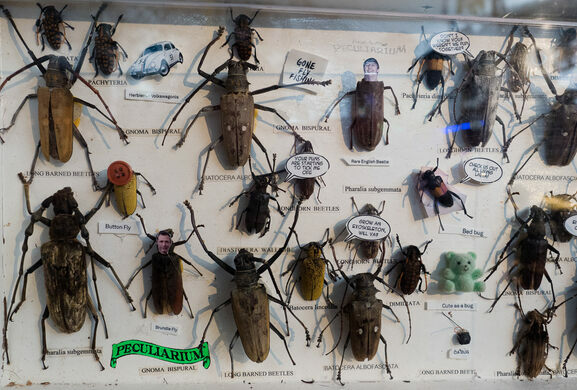 Update: The ice cream parlor is back after a remodel, complete with meal worm and edible scorpion topping options. Open every day 10:00 a.m. to 8:00 p.m. Easy to find, on a neighborhood street with parking. $5 admission but free in costume or with a cute, well-behaved dog, cat, iguana, Gila monster, parakeet, boa constrictor, or whatever (generally) non-lethal creature you consider to be your pet. Just visited 4 days ago. Tiny horses tethered to antique rings are scattered around the city. A 2,500-pound wooden nickel makes this woodworking museum easy to spot from the road.